The High Representative for the United Nations Alliance of Civilizations, H.E. 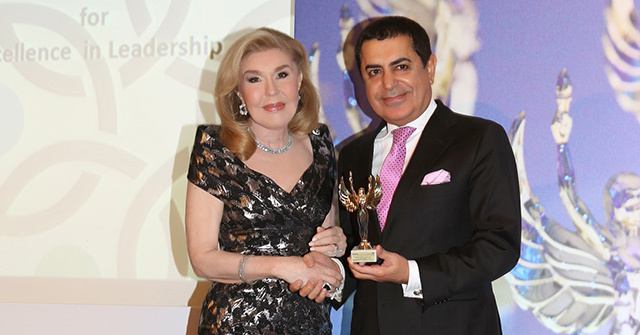 Mr. Nassir Abdulaziz Al Nasser, received the Excellence in Leadership Award from the Global Thinkers Forum for the year 2013, in recognition for his vision and leadership in the promotion of tolerance , intercultural dialogue, and peaceful co-existence. The Mayor of Athens, Mr. Yiorgos Kaminis and Mrs. Marianna Vardinoyannis, UNESCO Goodwill Ambassador as well as eminent personalities in the Greek society attended the award ceremony which was hosted by Ms. Elizabeth Filippouli, Founder & CEO of Global Thinkers Forum. High Representative Al Nasser had addressed the Global Thinkers Forum by delivering the keynote speech on “Leadership and Collaboration”. Participants at this year’s forum held in Athens on December 3-4, sought innovative answers to some of the world’s key challenges in government, business, arts and technology. Mr. Al-Nasser stressed that intercultural dialogue starts with each nation’s leaders. He said it is the responsibility of leaders to protect those whom they lead and that inability to do so, would mean that they had ultimately failed their people.